This summer we had the good fortune to return to Belgium for 33 days, as I organized a study abroad trip with the MUW Honors College. For Kim, Aidan, and I, it was a chance to relive some of our experiences from 2006, when we lived in Leuven for a semester. 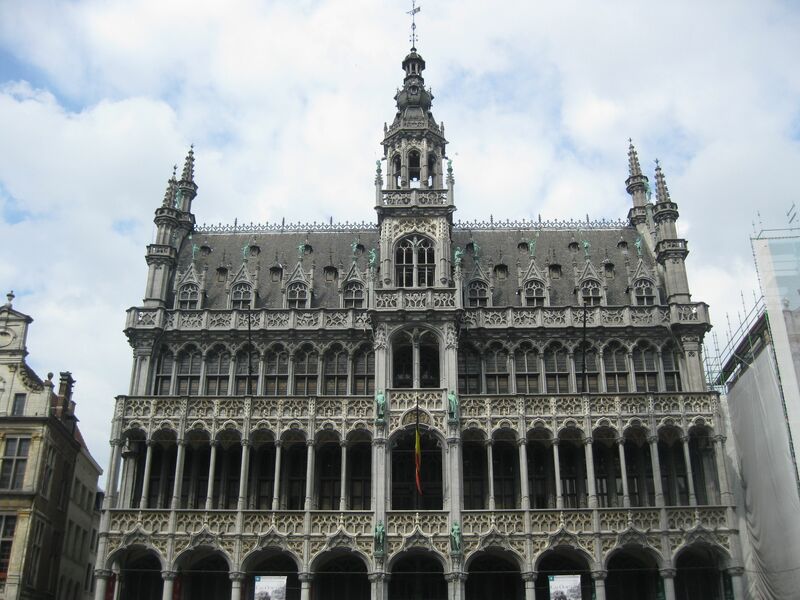 This time, our apartment was in Brussels, and the experience was a little different. As a Fulbright Scholar in 2006, I taught classes at the Catholic University in Leuven (and Lessius Institute in Antwerp). This time, I was also teaching classes, and leading the group of 16 students and one other professor on excursions. The complexities of traveling with a group made me admire tour guides much, much more! 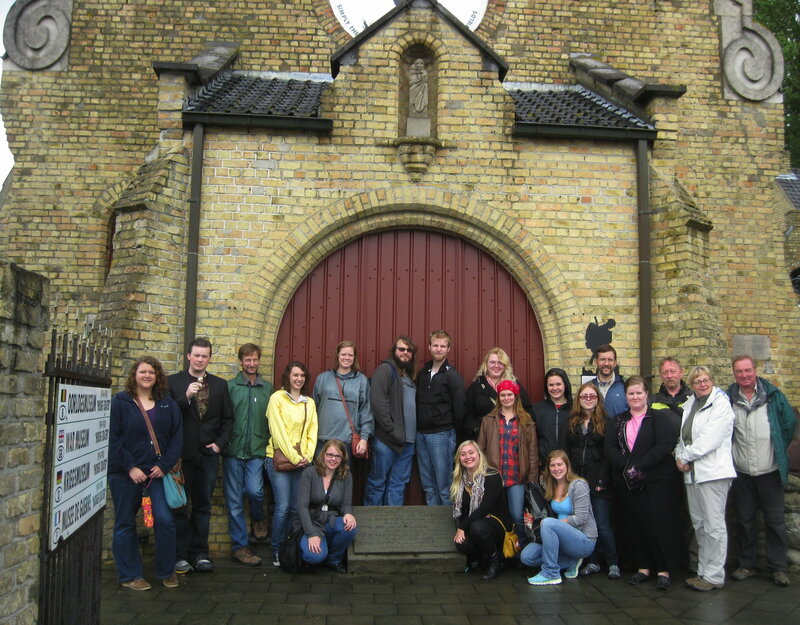 But we had a good time visiting Bruges, Amsterdam, The Hague, Ypres, and Ghent with the group. Belgium is a great place to travel. We were able to get very affordable group rates on the trains — it did help to be able to communicate in Dutch or French, since group reservations can’t be made in English. Since we had a big enough group, we got 70% off on most of our train rides, and sometimes a ticket to a museum could be included. Most cities have guide associations that offer guided walking tours in English (or any number of languages). In Ypres, we found a great mini-van tour of the WWI battlefields of the Ypres Salient. Flanders Battlefield Tours took us to sites associated with some of the war poets, and they showed us British, French, German, and American graveyards as well as a private museum at the Hoog Crater, where soldiers tunneled under the trenches and then exploded dynamite to drive a wedge in the lines. Besides introducing students to the history and culture of Belgium, I taught a class on Modernist European Poetry and Art. We studied primarily Belgian poets (French- and Dutch-language) and went to several museums in Brussels and on our travels. We had a lot of fun, and students were introduced to movements in art that most hadn’t seen before (though a few had seen them in art appreciation or history classes). The students also tried their hands at translating, and though they made some translation errors (none had studied either French or Dutch), they learned a lot about the process of translation and came away with a better appreciation for the poems. My colleague taught a Political Science class on the European Union. Since our apartments were in the heart of the European district, students had ready access to the EU library and institutions for research. They also learned a lot by living in a multi-cultural neighborhood, going to street markets, eating fries from stands on the street, and walking around the city full of great architecture, from Art Nouveau to the contemporary EU buildings. All in all, it was a great experience.